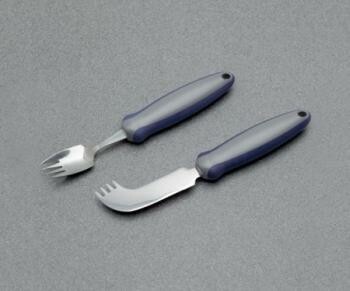 The Splayed Fork and the Nelson Knife are designed for one handed eating. Newstead One Handed Cutlery...The Splayed Fork and the Nelson Knife are designed for one handed eating. The Splayed Fork combines a spoon and a fork into one handy utensil. It is a pronged fork with edges designed for cutting food and a deep rounded body which functions like a spoon. The Nelson Knife is a knife with a cutting edge that ends as a curved pronged fork, enabling food to be picked up.Weight: 80g each.